I always make this wreath for my holiday parties. 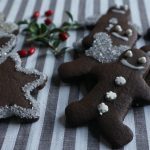 It is easy to put together and it looks pretty on the table. You can make it a day or two ahead of time and just add the parsley at the last minute. The combination of bacon, parmesan and green onion mixed in with the cream cheese is really good! In a medium size bowl, beat together the cream cheese, mayonnaise and parmesan cheese in an electric mixer until smooth. Mix in the crumbled bacon and green onions. Option 1- Line a small, round tube pan with plastic wrap. The one pictured here is 8.5 inches round with a 2 inch wide well. Spoon the cheese mixture into the pan and spread evenly. Cover with additional plastic wrap and refrigerate at least 30 minutes. To serve, remove the top layer of plastic wrap and invert pan over serving dish. Remove the pan and the plastic wrap liner. 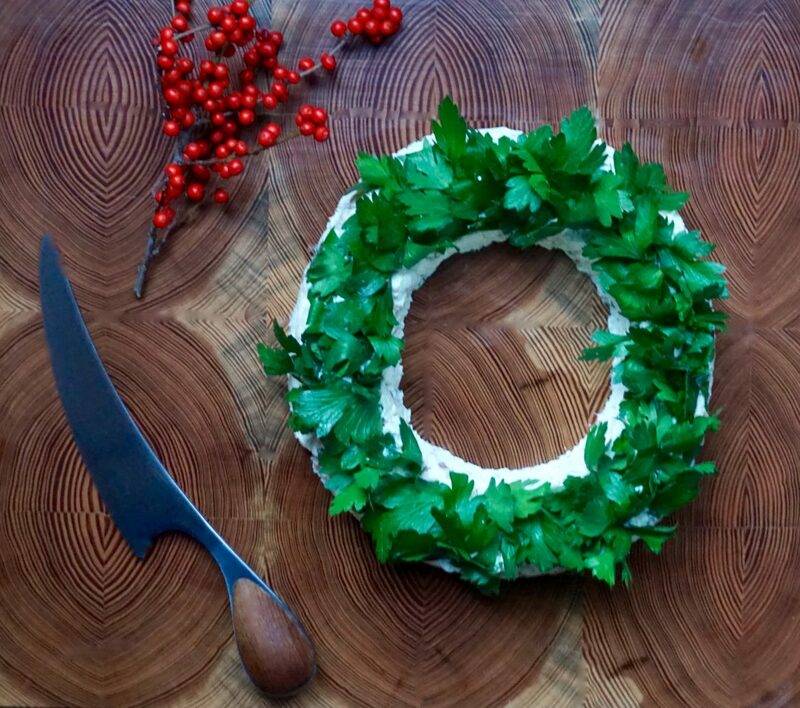 Cover the wreath with chopped parsley. 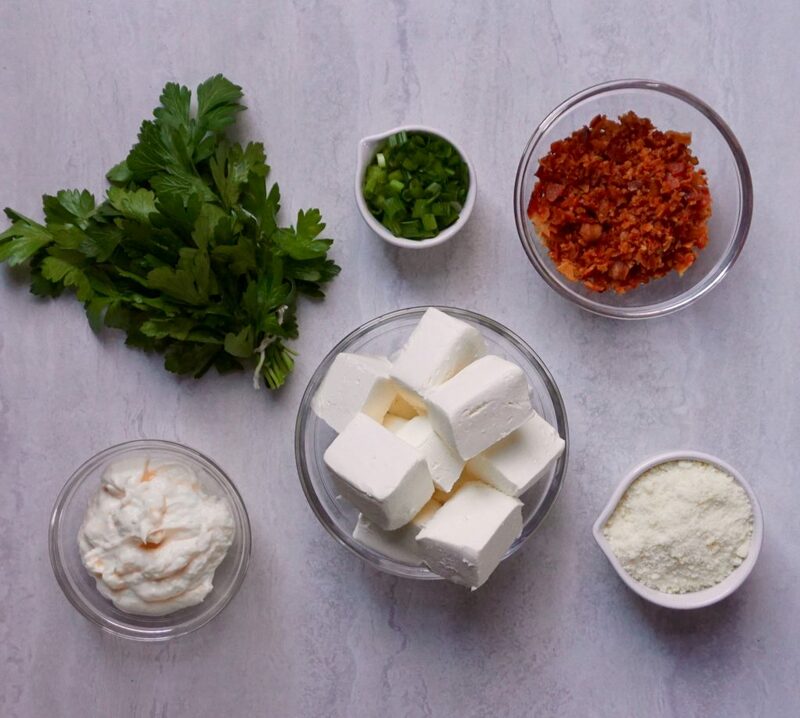 Option 2 – Refrigerate the cheese mixture for 30 minutes. 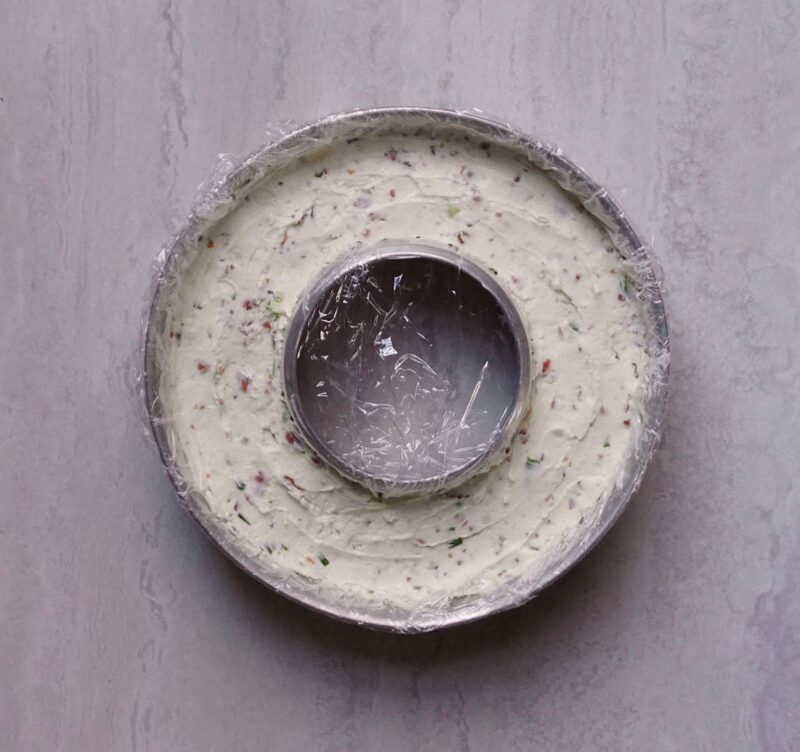 Form cheese mixture into a long roll with your hands and shape it into a wreath, approximately 8 to 10 inches in diameter, on your serving platter. Cover the wreath with chopped parsley. Option 3– Place a small bowl upside down in the center of your serving platter. Spoon the cheese around the outside of the bowl, all the way around. 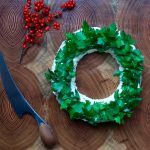 Remove the bowl and smooth the cheese with a knife or spatula so you have an evenly shaped wreath. Cover the wreath with chopped parsley. 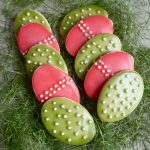 This could also be served on a plate or in a bowl if you do want want to make the wreath.